The Union de la Industria Militar is one of Cuba's small arms manufacturers tasked with the development of new technologies and armaments. 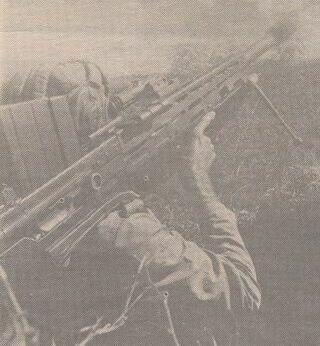 The MAMBI-1 was designed to be a Anti Material Rifle to be used against helicopters, soft skinned vehicles and the like, it fires the powerful 14.5mm Soviet cartridge used in the KPV machinegun. In design it is a shoulder fired bull-pup rifle, probably heavily mutuated from the american BARRETT M82A2 design, which fires from a 5 round box magazine, the weapon is fitted with a muzzle brake to help reduce the significant recoil associated with this cartridge. Little is known about the design, it has seen little press in the mainstream Western sources.